The yellow Magnetic Box is ideal for smaller miniature sets (e.g. skirmish games), dice and game cards. 1. Select the desired Half-Size foam articles in our online shop. Note the article number, e.g. HS010RS. The first three digits of the article number indicate the height of the mat in millimeters. In our example the foam tray HS010RS is 10 mm high. 2. Enter the article number in the "Tray 1" input field. If you want to order a foam tray several times, please note the quantity in front of the article number like this: 2 x HS010RS. 3. Enter the next desired article in the following field "Tray 2". Proceed until the total height of 40 mm is reached. 4. If there are not enough input fields available, simply enter the additional mats separated by a "/" in the last field, e.g. HS020BO / HS005B. 5. Label unused input fields with "none". Please note: All fields must be filled in before you place your order. 6. To finish, click "Add to Cart". For Pick and Plug foam trays, do not forget to add 10 mm for the bottom. Therefore, always enter the Pick and Plug foam trays along with the mat for the base in one field. For example: HS025RS + HS010B. 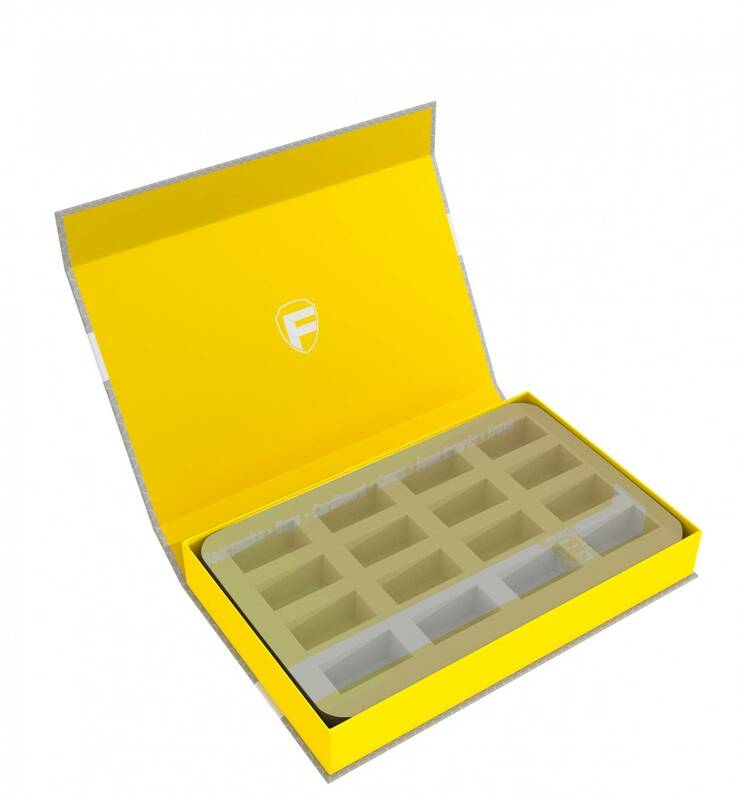 Only Half-Size foam trays fit in the yellow Magnetic Box. These can be recognized by the first two letters of the article number (HS = Half-Size). The indicated price applies to a yellow Magnetic Box filled with a maximum of 40 mm Half-Size foam. The Magnetic Box is the ideal solution for storage and transport due to its low weight and the flat, rectangular shape. It consists of coated solid cardboard in modern Feldherr design. The yellow box, in which the foam mats are placed, is firmly glued to the casing. This also serves as a lid. Two integrated magnets on the flap and front allow a seamless and easy closing, so that nothing gets lost even during bumpy transport. 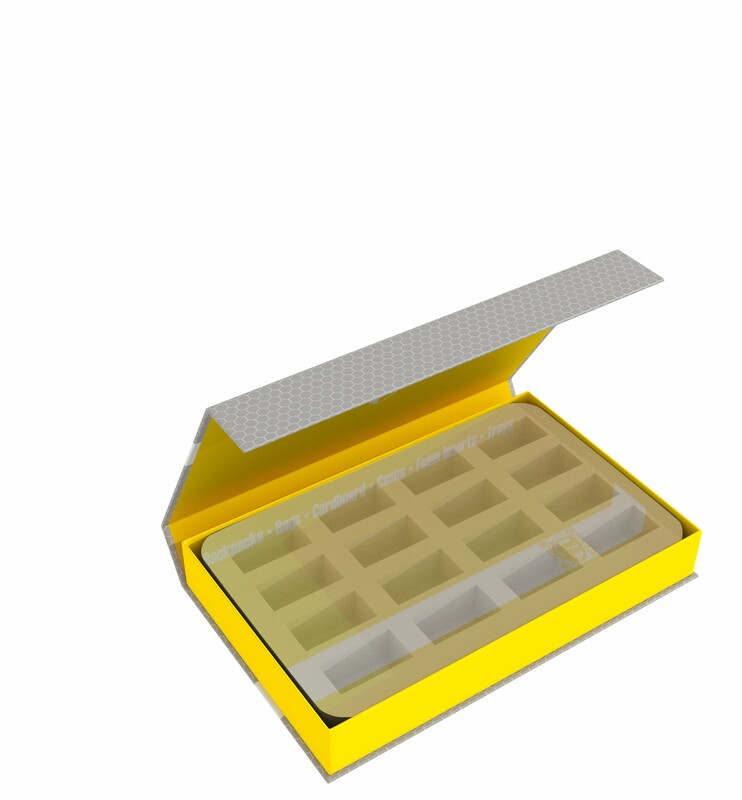 Of course, this yellow Magnetic Box is not only suitable for miniatures and game material. Painting sets, model making accessories or mobile phones can also be stored here safely and dust-protected. They are just as easy and safe to transport. However you fill the box, the contents are always well protected.